The conference was an opportunity to celebrate the work of the North Wales Dementia Network, and hear the experiences of people living with dementia, as well as those of numerous organisations who are also working on dementia related support and research projects . There were 110 delegates and the presentations were all recorded. Follow this link to see the Powerpoint slides and listen to the speakers from the day. Link to a Storify from the day. Highlights of the day included a panel discussion of people living with dementia sharing what is important to them, living with dementia and the importance of contributing to the consultation on the first Dementia Strategy for Wales. 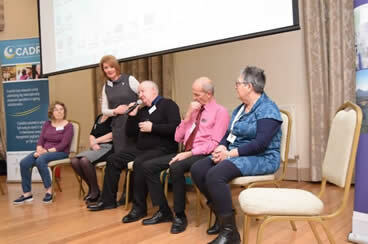 Members from Flintshire described their plans to establish a ‘friendly face’- post-diagnosis peer support with those living with dementia able to meet and talk to people recently diagnosed. Tommy and Gina from Liverpool shared an array of work they had completed since establishing SURF in 2014. Guest speaker Prof John Keady introduced the extensive research on neighbourhoods in Manchester. Prof Bob Woods de-mystified the terminology and explained the importance of including interventions on an ‘ecopsychosocial’ level. Gwynedd Council exercise officers gave an interactive and fun-filled Dementia GO exercise class taster session after lunch leaving the room energised for more discussions. The contribution of the arts both visual and poetry were part of the day. Dr Gill Windle shared the Dementia and Imagination research with artist Carol Hanson reflected on the importance of humour in our lives through the ‘Doris and Ivor’ installation. The importance of tackling stigma through educating children was shared with a clip of ‘Hen Blant Bach’ a recent S4C documentary. Delegates attended two breakout discussions based on topics chosen by the members in the network meetings and summary films are available for viewing on the link. 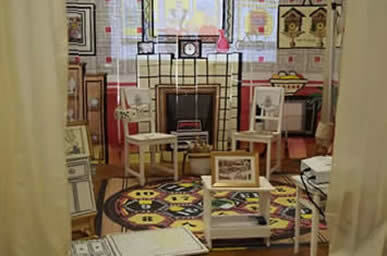 Delegates also had the opportunity to see two art installations. 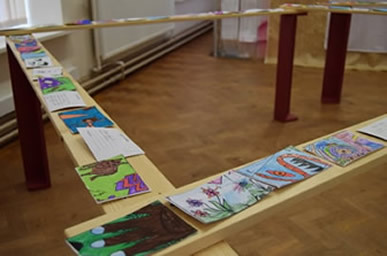 Imagining a Dementia Friendly Future was co-created by network members and school pupils from Ysgol Brynrefail, Llanrug, Ysgol Trefnant, Denbigh, and Ysgol Nannerch near Mold (by artist Lisa Carter). The installation ‘3 Muddle street’ by Carol Hanson featured characters ‘Doris and Ivor’ which is part of a research project called Dementia and Imagination.